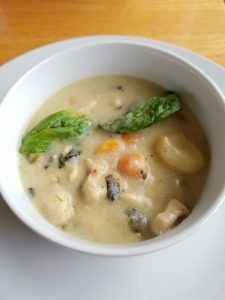 Warm, creamy, and delicious: this Chicken Gnocchi Soup is easily made at home any time of the year. With this recipe, you’ll have a comforting dish that’ll warm your heart and soul. You can add more spinach to your soup to boost your intake of Vitamin A and Iron. Chop the carrots. Dice the onions. Mince the garlic. Using a large pot, heat the olive oil. Dice the chicken and cook the chicken for 5-7 minutes until cooked. Remove chicken, add carrots, onions, and garlic to the pot and cook. Cook until onions are translucent. Slowly mix in all of the flour. Slowly stir in the chicken broth and let it simmer for 10-15 minutes or until it thickens up. In a separate pot, begin to cook the gnocchi according to the package’s instructions. Stir in milk into the chicken broth and vegetable mix. Bring to a boil. Add in the parsley, salt and pepper. 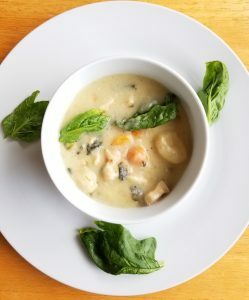 Once it the soup is boiling, lower the heat and add the gnocchi, cooked chicken, and spinach. Allow the soup to simmer and thicken for about 10-15 minutes.